The perfect spare for use with your Kegel8 Ultra 20 or Kegel8 V For Men, the 50x100 Reusable Electrodes are ultra-high quality skin electrodes designed to be comfortable and easy to use. Simply remove from the plastic backing and place onto the clean, dry skin. The electrodes are reusable, and if cared for correctly as per the instructions in the packet, can last around 4 weeks if used daily. 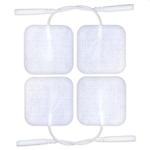 The low-allergy conductive gel helps the electrodes to stick to your skin while reducing the risk of allergic reactions, and the high-quality design helps you to avoid uncomfortable hot spots and nipping as can occur with lower-quality electrodes. If used daily you will get up to 4 weeks use from these electrodes, after which time they may begin to lose their adhesiveness. To make them stick for a little longer you can dab a bit of water on to the adhesive side of the pad – this should give you a little more use. We also recommend you cover the adhesive pad with the packaging they come with and store them in a cool, dry place. Skin electrodes are a fantastic option if you can’t or do not wish to use an internal probe to strengthen the pelvic floor. We ensure only to use the best electrode manufacturers and as such we only sell high quality electrodes that don’t pinch or nip the skin and certainly won’t produce hot spots. 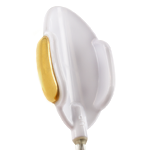 We know the electrodes we sell and recommend are 100% safe and provide optimum levels of NMES (Neuro Muscular Electrical Stimulation) to help strengthen your pelvic floor. 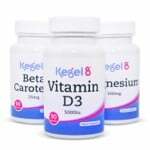 Simply attach to your Kegel8 Ultra 20 or Kegel8 V For Men via your leadwire, and use as instructed in your User Guide.